Adopting a pet from a shelter isn’t as easy as it seems. Do you want to add a fur-kid to your family while saving a life? If so, head to your local animal shelter or rescue group to adopt a dog or cat. On a typical day, Dallas Animal Services (DAS) and Fort Worth Animal Care and Control both have 700 cats and dogs in their care. This August (the latest month for which I could find shelter statistics), DAS took in 2369 dogs (1481 strays and 888 owner-surrenders), with only 616 dogs reclaimed by their families. That same month, 748 cats (200 strays and 548 owner-surrenders) landed at the city shelter, with only 13 kitties reclaimed by their people. DAS relies on adopters and rescue groups to save as many animals as possible. Consider your options — shelter or rescue group? The first step is to choose an animal shelter or rescue group. In addition to DAS, there are many other shelters in the DFW Metroplex. Check petfinder.com, petharbor.com or another animal rescue database to see the adoptable animals in the various shelters. Keep in mind that not every animal may be posted when you check, and the dog you fall in love with may be adopted before you get to the shelter. But at least you’ll have an idea of what animals are available. People sometimes tell me, “I’ll go to a shelter because I really want to save an urgent dog.” While I appreciate their desire to save a life, I remind these compassionate people that rescue groups get most of their adoptable animals from local shelters. If you adopt my foster dog, I will have room to save another shelter dog. Then the foster parents do the hard work of bringing home an unknown shelter dog, helping him adjust to home life, house-breaking him, and discovering whether he gets along with other dogs and (in some cases) children and/or cats. When you adopt a dog or cat from a rescue group, you will know a lot more about what you’re getting. Furthermore, rescue groups usually allow home trials so you can be sure the animal is a good match for your family before you adopt. Prepare for your shelter visit. 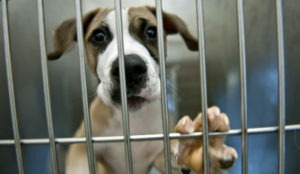 Many shelters require adopters to show a drivers’ license to adopt an animal. If you rent your apartment or house, some shelters may ask to see your lease agreement to be sure pets are allowed — particularly if you’re adopting a breed (e.g., a pit bull, German shepherd, rottweiler, doberman or husky) that is often subject to breed restrictions. Check the website and/or call the shelter to discover what’s required to adopt an animal. Ask about the adoption fee and what form(s) of payment are accepted. Some shelters may not accept credit cards. While adopting several dogs from the Greenville shelter (for a rescue group), I had to make a special trip to a nearby ATM to get cash, since they didn’t take credit cards. Establish your criteria — and adhere to them. You may be tempted to bring home the first adorable dog that catches your eye and steals your heart. However, that dog may not be a good fit for your lifestyle. To avoid an “impulse adoption,” make three lists: what you absolutely must have in a dog, what you don’t want in a dog and what you’d like to have, if possible. If someone in your family is highly allergic to dogs, one essential must-have would be a hypoallergenic breed. What’s your lifestyle? Do you work long hours? If so, a puppy that needs a potty break every four hours isn’t your best choice. Do you travel frequently? If so, you may want to choose a smaller (for airplane rides) or car-friendly dog that you can take with you occasionally. If you won’t take your pup with you, factor in boarding or pet sitting fees when planning your pet budget. Are you active or a couch potato? Younger and active breeds will need daily exercise (read: at least 30-minute leash walks or runs) to keep them from bouncing off the walls. Dogs rarely get enough exercise in the backyard, so don’t count on backyard time being enough activity for a young lab, border collie, Jack Russell terrier or other active dog. Do you want a snuggly Velcro dog or a more independent pup? A neighbor who helps me care for my foster dogs described affectionate Rosie as “clingy.” She prefers a more independent dog. To groom or not to groom? Like people, some dogs are high maintenance. Some long-haired dogs (e.g. Pekingese or golden retrievers) need to be brushed every day to prevent matting, while others (poodles and other frou-frou dogs) need to visit the groomer regularly. You can hire a mobile groomer who comes to you, but you’ll still have to block out time for those spa appointments. Also consider your tolerance for dog hair in your home and on your clothing. Some breeds shed more than others, so stick with low-shedding breeds (e.g., Yorkshire terriers, Schnauzers and poodles) if you don’t want to pick up hair all the time. These low-shedding dogs are a better choice if someone in your family is allergic to dogs. What breed(s) do you prefer? Each breed has its own energy level, personality and grooming requirements, so be sure to do your research. That French bulldog or golden doodle you have your heart set on may not be the best match for your lifestyle. Choosing a dog based on appearance may get you into trouble. One of my neighbors bought a doodle (poodle mix) puppy that grew up to be a huge, high-energy dog that she can’t handle (control?) on walks. Her partner has to walk the dog every day. In my next column I’ll cover what to look for when you meet dogs at the shelter or rescue group adoption event. Stay tuned!